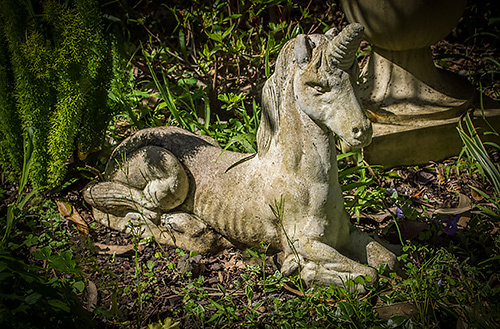 Better the unicorn you know than the one you don't, we thought, passing this garden statuary yesterday morning. So we uncapped the lens, lined up the shot and bagged the mythological creature. Neighborhood Unicorn. Shot at f8.0, 1/800 second and ISO 200. Processed in Adobe Camera Raw using the-HDR-in-one-file trick mentioned recently. There are urban definitions of unicorns that the ancients would shake their heads at. We aren't ancient but we aren't going to do your googling for you on this one. Our own appreciation is quite different. And why not? Mythological creatures can mean anything you want them to mean. We tend to think of a unicorn as a goat designed by an art director. Which is perhaps a compliment if nevertheless shrouded in technical incompetence. One horn does not a goat make, after all. But a pony is an improvement over even a heavily photoshopped hairy old goat. Having our unicorn in the bag as a Raw file, we still had to make something of it ourselves. And for that we turned to Adobe Camera Raw because we wanted to try David Williams' trick we mentioned in our April 9 Around the Horn. He did that in Lightroom but it's the same sliding around with Camera Raw in Photoshop. Camera JPEG. For comparison to the processed image above we extracted the JPEG from the Raw file. We always wonder what we're missing when we cite a different technique than our time worn favorite approach of Clarity, Shadows, DeHaze, Contrast, Exposure. 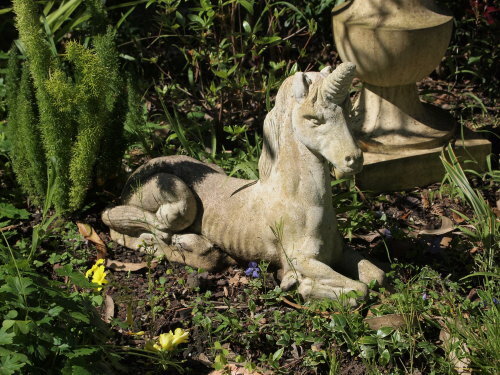 And this did yield a different result, salvaging the stone-like texture of the unicorn and opening up the shadows of the flora around it. We did start with the Adobe Standard profile rather than one of the more lurid options, too. And no, it didn't work at all in black-and-white. Just too busy. We added the vignette for that very reason. Too busy. We wanted to spotlight the unicorn (they're very hard to find in the wild and in a photo both). And we doubled the vignette, making a second over the first with the Camera Raw filter. If you're going to be tinkering with the impossible, you might as well go crazy. No one will ever be able to tell.